Finally, yesterday, Manny Ramirez re-signed with the Dodgers to a two-year $45 million deal. 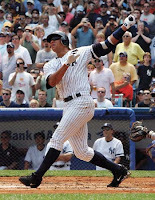 I know he is not Yankee related, but he is a topic of discussion for any kind of fan. You either love him or you hate him. Personally, I love the guy. Would I like to see him in pinstripes? - Not in a million years. With the press the Yankees get and the Manny sideshow off the field, there would be madness every week at the next thing Manny says in an interview. If the Yankees had the money, it's hard not to go after a middle of the order like that. No team has ever had a 3-4-5 better than what the Yankees would have had if they had signed Manny. Plus, with the Yankees much-improved rotation this year, you would have to immediately favor the Yankees as World Series champions. Dropping all the outside distractions changes a lot, huh? Take Terrell Owens for example. He just got cut from the Cowboys - and it wasn't because of lack of talent.